I am not a wildlife photographer by any stretch of the imagination. I am always so impressed with people that get amazing close up shots of wildlife from their adventures in nature, particularly action shots. 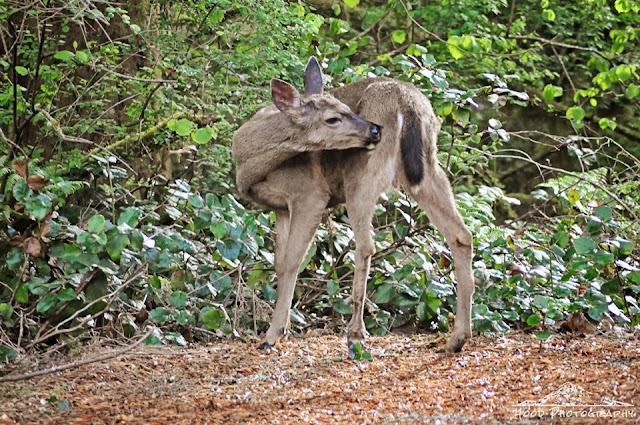 With that being said, I could not resist attempting to get a photo or two of this courageous yearling, who came out of the woods with three of his family members during a hike my son and I took along the Sandy River on Sunday. I was able to get fairly close to all 4 deer, and this one in particular was very patient with me while I snapped away. What a great capture for the day, Sarah!! I wish I could do so well if I ever happen to run into one of these youngsters, but as you know, we don't see many here in Portland!! Thanks for sharing!! A great photo and a cute deer. Beautiful capture! I've seen deer that can be that patient, but not yearlings before... they do tend to be skittish.